PEI Humane Society Cupcake & Bake Day! Name: PEI Humane Society Cupcake & Bake Day! What is the PEI Cupcake & Bake day? 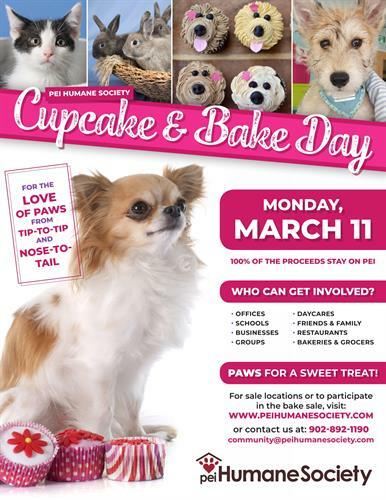 PEI Cupcake & Bake day is different than National Cupcake day (OSPCA) and only supports the PEI Humane Society. This unique event ensures 100% of the proceeds stay right here on PEI, saving more Island animals. This special day will see the Island community come together to host a treat day baking cupcakes and other goodies on Monday, March 11 and throughout the week. Bring your sweet treats to work or other places like family gatherings and ask people to leave a donation for the PEI Humane Society. Funds can be submitted online or at the shelter at 309 Sherwood Road. It’s an easy way to help the only companion animal shelter on PEI! March 11th 2019- ALL DAY!